The transition from novel to television creates the issue of compressing the story into episodes limited by time and budgets. HBO 's translation of Game of Thrones is a rich tapestry of characters and narratives; however, the viewer can lack backstory, geographic awareness, and an understanding of character relationships. 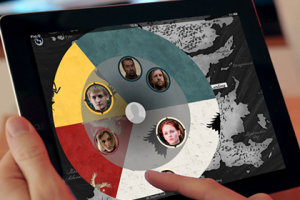 This second-screen companion app orients viewers to the world of Westeros by mapping families throughout episodes. Greater character understanding is achieved by the mapping of character relationships, both during characters present in each scene or within the episode. 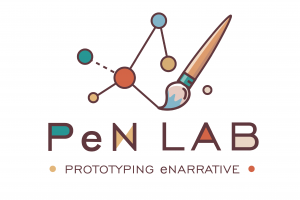 The Prototyping eNarrative Lab (PeN Lab) at Georgia Tech applies digital information design and interaction design principles to digital storytelling to create more complex and expressive narratives, focusing on emerging platforms like experimental television, virtual reality, and augmented reality, and on the intersection of storytelling with game design and simulation design.